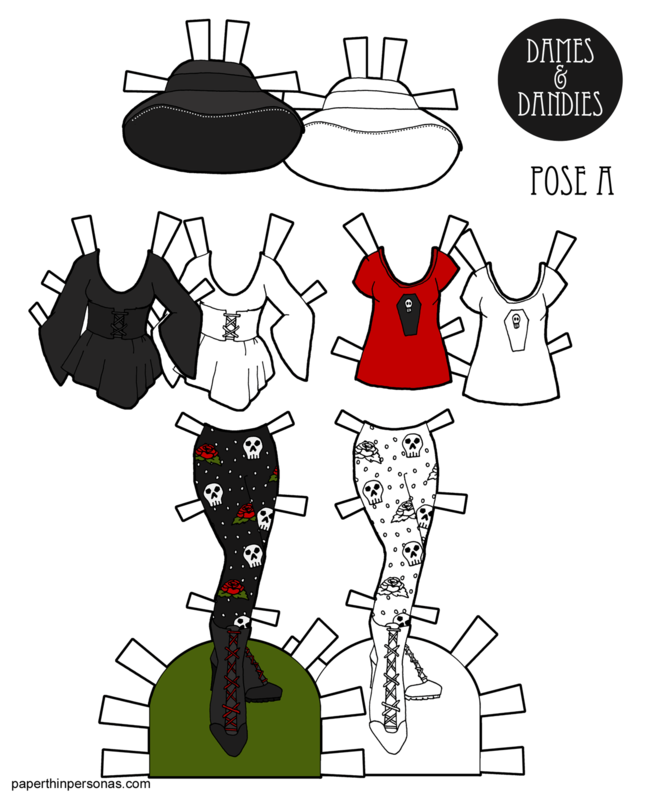 Printable Black & White PDF Printable Color PDF More Paper Dolls & ClothesSo, I knew I weanted to do a mini-wardrobe for the A Pose dolls since my two other mini-wardrobes were for the B Pose paper dolls. It was actually kind of difficult to come up with a theme for one. I wasn’t really interested in doing contemporary fashion, but we are getting close to September and that’s my favorite month for fashion magazines. Settling on post-apocalyptic, I then thought about mix and match options. Mini-Wardrobes are mini-wardrobes in my head, because they have a variety of outfit options. That usually translates to at least two bottoms and more than two tops. I started with the cropped jacket thing actually and then worked my way through potential layering pieces. Most of these post-apocalyptic paper doll clothing designs were inspired by things from my Post-Apocalyptic Fashion Pinterest board. The skirt and the cropped jacket thing were both based on these designs. The pants were based on this pair. The rest of the designs were largely meant to fit in with those piece, rounding things out to increase mix and match options. Mathematically speaking, there are 18 clothing combinations, not including the fact that there are gloves or the fact the that the paper dolls could be barefoot. So, I do think this is a pretty successful paper doll collection, all things considered. What do you think? Good set of mix and match options? Let me know in a comment. 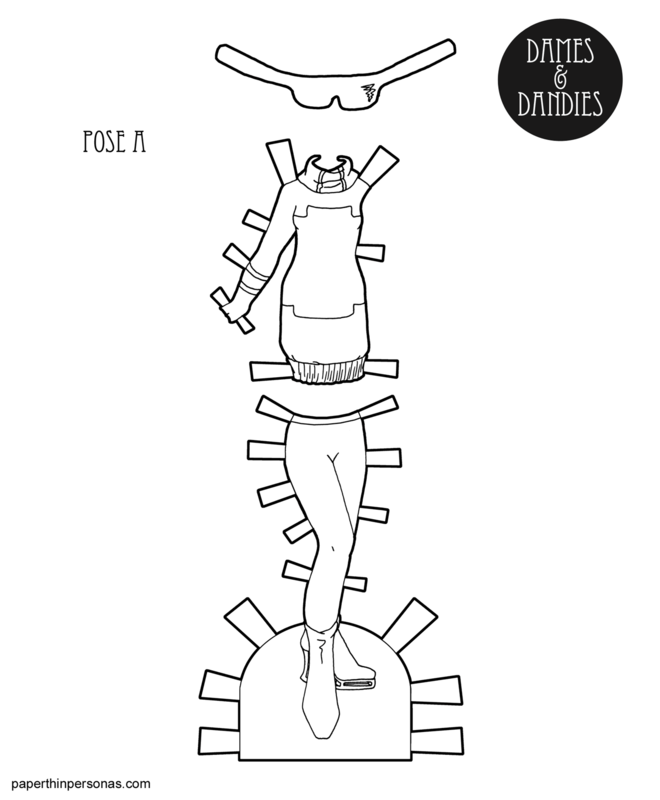 Printable Black & White PDF More Paper Dolls & ClothesSo for the last post in our week of coloring pages, I am happy to share this cyberpunk set for the A pose ladies. Just perfect for the cyberpunk Aisha I posted back in May. That was a long time ago, wasn’t it? These last few months have gone by so quickly. Anyway, I imagine this is a sweater dress, though I suppose it could be made of any kind of knit. The boots were fun. The foot pose of the A pose dolls isn’t very conducive to side looks at shoes, so I’m always pleased when they work out. The sunglasses will need to be folded around the dolls head and then taped, or glued to make a loop. I made the taps extra long, so you can trim them down as needed and accommodate a lot of different hair styles. Love the blog? Want to help out? Consider donating through Patreon, liking the facebook page and/or leaving a comment. 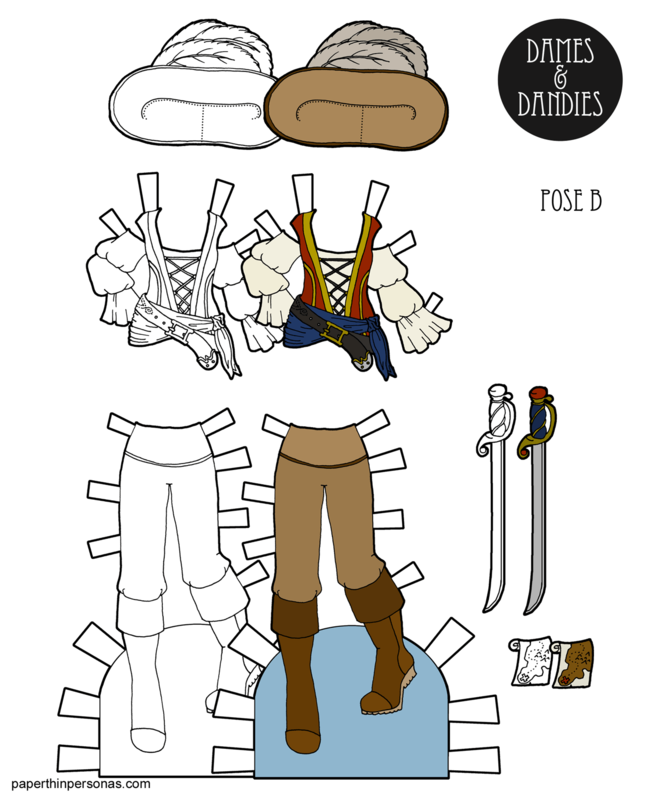 Printable Black & White PDF Printable Color PDF More Paper Dolls & ClothesBack when I posted this pirate set for the C Pose guy paper dolls, I asked if people would like to see more pirate paper doll outfits. And since I got an adamant ‘yes’ from Annemarie, I decided to go to for it. 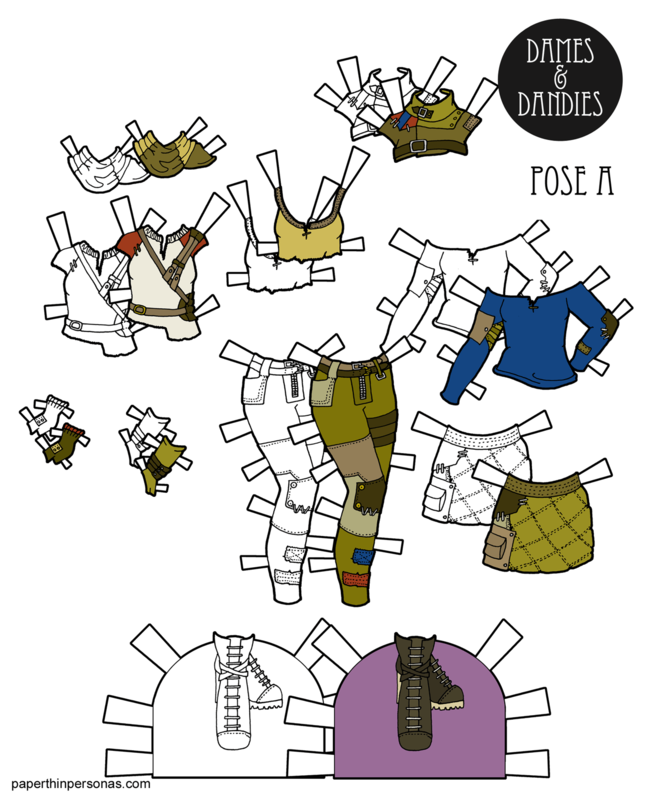 After all, pirate printables seemed like a fun thing to explore through paper dolls. 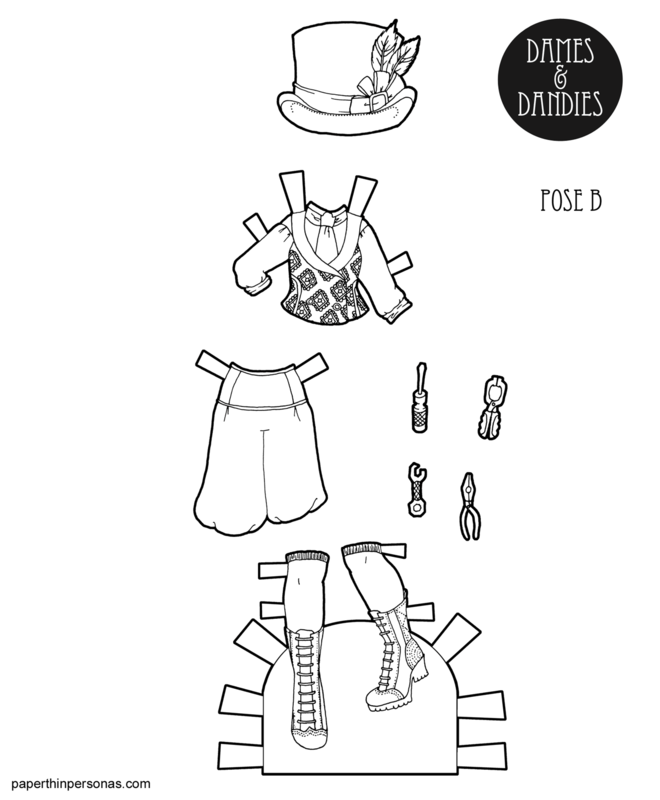 So, here is a lady pirate costume for the B pose paper dolls. It’s totally an exercise in fantasy, but than a lot of my paper dolls are. Along with her stylish outfit, our lady pirate has a treasure map and a handy sword. After the agony of trying to draw a flintlock pistol, I wasn’t doing that again. I’ll openly confess that I think part of my love of pirates is directly linked to my love of boats. I adore being out on the water. I grew up in a family that commercially fished, so I grew up on the water. I find it very soothing and peaceful to be out in the ocean- though I am prone to seasickness on the open water. I’ve had requests for pirates from a lot of parents who are throwing pirate themed birthday parties. I think this set of pirate printables and my other set for the guys would be really fun for kids. Paper dolls are great ways to encourage storytelling play. That’s really all I have to say about this one. Tomorrow, there will be some clothes for the C Pose guys. Meanwhile, if you want to support the blog, think about donating through Patreon. Printable Black & White PDF Printable Color PDF More Paper Dolls & ClothesI think I read last October that for the first time, superhero costumes outsold princess costumes. This makes me a little sad, because I am sucker for a good princess dress. It also highlights the popularity of superheros and helps explain today’s superhero costume paper doll. I love a good superhero movie. I happily watched Deadpool 2 last weekend and Infinity War the weekend before that. I enjoy the splash and the explosions. I like seeing things blow up and I like seeing adventure. When I design a superhero costume for my paper dolls I try to keep things fairly neutral. I don’t really want to decide too much about the superhero powers or anything. I want the person who colors the paper doll or cuts it out to be able to decide what she can do. It should be for them to decide. So, with this superhero costume paper doll I went with a star motif (which I tend to use) and I made a magical sword for smiting evil doers. I chose colors based on the old three color printed comics, so red yellow and blue. All bright bold primaries. I’m not totally pleased with the color scheme, but I think it works pretty well. 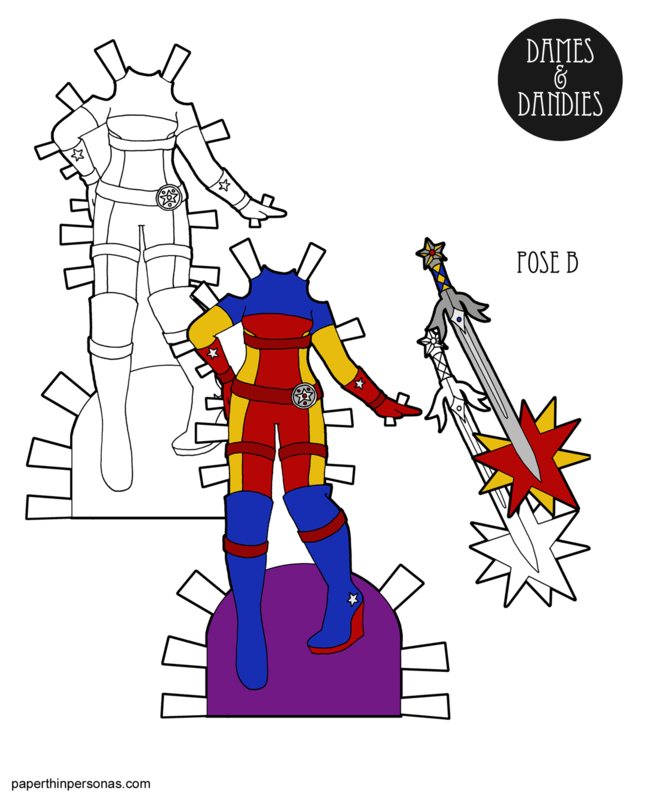 Besides, this is just the first superhero costume paper doll, I can always make more. That’s the wonderful about paper dolls. 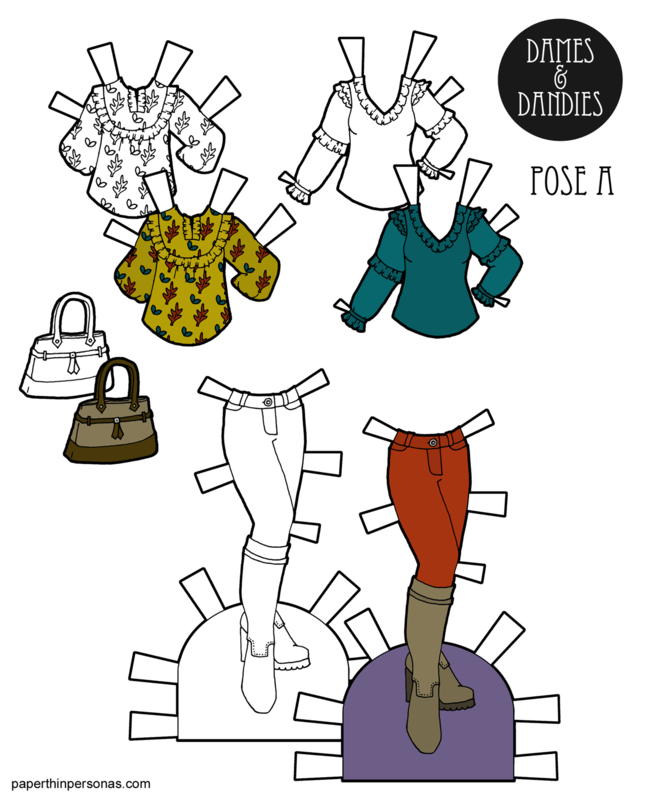 Let me know what you think of today’s paper doll in a comment. I always love hearing from you guys.